At Fakuma 2012, Maplan will highlight its liquid silicone rubber (LSR) application: a horizontal MHF400/200edition with SILjector-injection unit equipped with the latest generation of control devices, the PC5000touch V3. 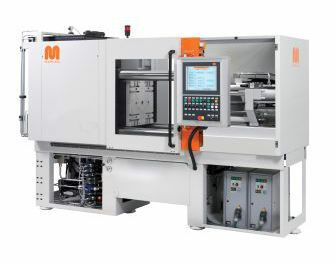 The MHF400/200edition, with 2,000kN clamping force, is a high precision SILjector-injection unit working according to the FIFO-principle with active backflow barrier and greatest dosing accuracy at 100ccm dosage volume is employed for LSR-processing. The unit is available with a volume of 100, 200 and 400ccm and built extremely compactly. The way the SILjector-injection unit is constructed allows a simple and fast cleaning of the machine for fast rubber compound change, according to the company. The injection pressure is 2.041bar for the 100ccm version. Optional for this LSR-process is a hydraulic needle shut-off nozzle, which is specifically tempered with liquid-cooled or -heated. Analogous to the vertical injection molding machines, horizontal machines are also available as “edition” and “edition-S” versions, notes Maplan. Currently available are models with 100, 200, 300 and 400 tons clamping force. The company will also exhibit two machines for TPE applications, the vertically clamping MTF220P/160editionS and a MTTF100P/40C in C-frame construction for corner overmolding.